Nigel mark II is finished and eager to get going to his new home - he's already found a comfy jiffy bag for his journey and is now waiting impatiently for me to draw the winner of the giveaway. 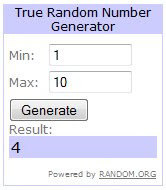 So without further ado I shall consult the Random Number Generator for a winner. "Wow, that top is very cool. I love the circles on the crocheted part - can't believe you made this yourself! Very Talents. I am in love with Nigel, very small and sweet - he could sit of my desk at work and bring me a bit of happiness during the day :-)"
Congratulations Katy I'll be in contact to find out your postal address - Nigel is very much looking forward to staying with you and seeing a little bit of the other side of the world! Thanks to everyone who took part in this giveaway, it was lovely to get so many comments and I'm just sorry that I don't have the time to make you each a Nigel. Perhaps this may give some of you the push to try a little crochet now though? WHoot! I'm the winner! and after reading my comment i now know i need to read my comments before posting them, i can't spell! Nigel is now packed up and ready for his trip to meet you - he's one very excited elephant. Thanks for taking part and I can't wait to see the photos of Nigel's new home. Hi there! Congrats on becoming a new mom ( I just read your quick profile on the sidebar). Get as much crafting in now while your wee one is still, well, wee. The older they get, the harder it is to find the time. Looking foward to seeing your next project. your little elephant are SO adorable !! !